Since Christmas is just around the corner, we thought that today's IKEA Vrijdag would review a toy sold by IKEA, just in case you have a little last minute shopping for a small child. The Ekorre Loopwagon/Toddle wagon was something we purchased for Little Man during our "big" IKEA trip in which we purchased most of our furniture. Whenever we visited an IKEA in the States or in Holland, the Little Man would find this cart in the store and drag it all around. When we made our big trip to IKEA, we still did not yet have our things from the States, and since the Little Man obviously loved this thing we decided to surprise him with it. 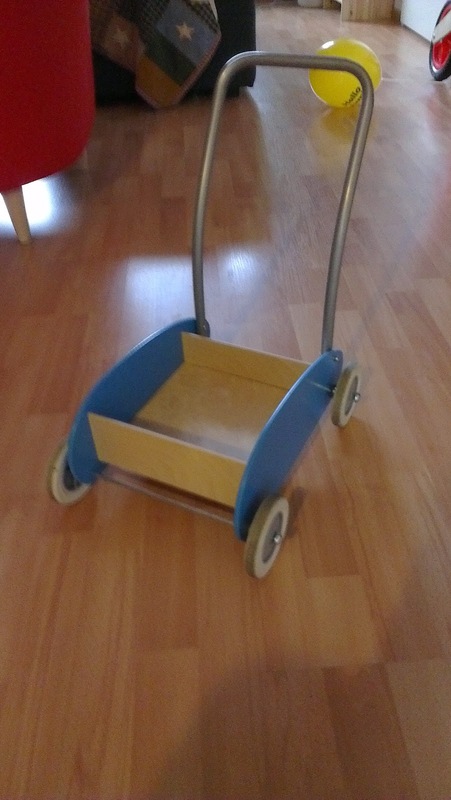 The only thing to attach on the cart is the handle, and you can choose to attach it at two different heights to make it easier for the child to walk with it. Just two screws and you're done and the fun can begin! It's made of birch plywood and steel and is sturdy enough for a child to put it through any number of tests. This works outside or in and has been well worth the little bit of money for any child 4 years old or younger. We give this toy a solid 5 Swedish meatballs on our 5 meatball scale. The cart was helpful when gathering acorns outside.